Dr. Shannon Bauman is pleased to announce that Jackie McKenzie, a Registered Dietitian and Sports Nutritionist is joining the Concussion North team. Carolyn will be accepting new clients starting on January 25, 2016. Contact Concussion North for more details about Jackie's practice and to book an appointment. Dr. Shannon Bauman is pleased to announce that Carolyn Glatt, a registered Physiotherapist is joining the Concussion North team. Carolyn will be accepting new clients starting on October 7, 2015. Contact Concussion North for more details about Carolyn's practice and to book an appointment. Dr. Shannon Bauman is pleased to announce that Lauren Orser, a certified Athletic Therapist is joining the Concussion North team. Lauren will be accepting new clients starting in September 2015. Contact Concussion North for more details about Lauren's practice and to book an appointment. Concussion North is turning 1! We are celebrating our first anniversary and wanted to thank all of the referring physicians, sports teams, and patients for making our program a such a great success. We appreciate your support and love participating in recovery and return to school, play and work. Dr. Shannon Bauman is pleased to announce that Jackie McKenzie, a Registered Dietician and Sports Nutritionist is joining the Concussion North team. Jackie will be accepting new clients in January 2015. Contact Concussion North for more details about Jackie's practice or to book an appointment. 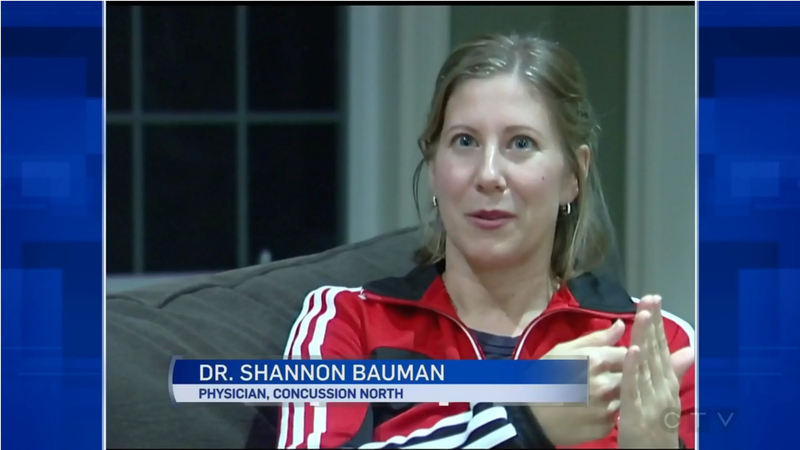 Dr. Bauman speaks to CTV News in Barrie about her own concussion experience and how it led to the founding of Concussion North. Click on the image to watch Part One. Dr. Bauman tells CTV News Barrie sports reporter Alistair Connolly about the Concussion North approach to concussion management. In the third part of the "Head First" segment, Dr. Bauman talks about the importance of educating teachers, parents and coaches about concussion prevention and management.